The Bristol-Myers Squibb campus in Devens, MA, used to be solely focused on large-scale biologics manufacturing. Recently, however, the campus added two buildings, a Biologics Development Building (for the early production of investigational medicines) and a Clinical Manufacturing Building (for the production of investigational medicines to support clinical trials). 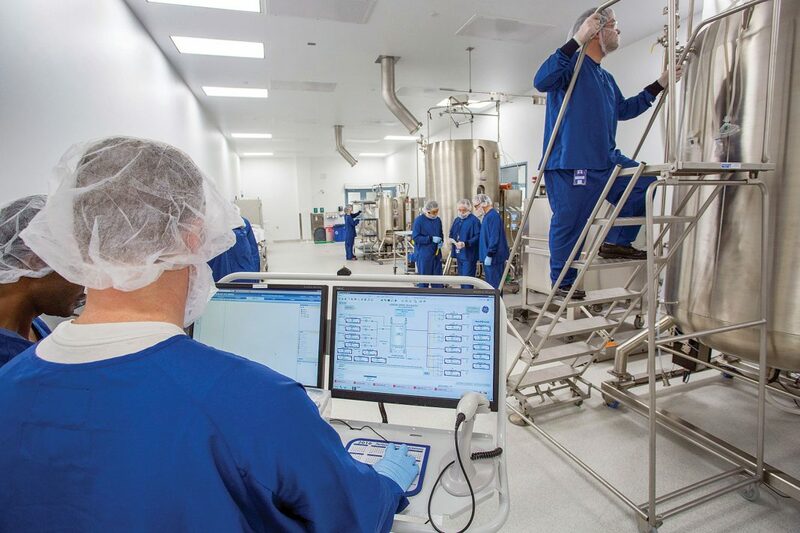 At the expanded facility, workers strive to accelerate development of the company’s growing portfolio of biologics medicines. The bioprocessing industry today is being yanked in two directions, as single-use technologies gain the ascendant, while at the same time there is still a demand for cold, hard steel for large-scale production. In order to gauge their performance, single-use technologies are evaluated on a small scale. Thus scalability is an important consideration, since modeling strategies depend upon their applicability when developing large commercial operations. Investigators must take cognizance of the construction materials, design of modules and other components, efficiency, and overall cost factors, according to a number of speakers at the recent annual Bioprocessing International conference in Boston. Storage, preservation, and transport of bulk drug products demand robust and resilient materials, explained Joe Cintavey, product manager and material science specialist with the PharmBIO division of Gore. Cintavey discussed the use of PTFE (polytetrafluoroethylene), a versatile polymer that has long been the core of the company’s product offerings, and its newest application in the area of bulk transport and storage. With much of drug development moving into the area of biologics, including vaccines, monoclonal antibodies (mAbs), and antibody drug conjugates (ADCs), keeping temperature-sensitive products stable is essential, as they are often frozen at temperatures from –40°C to –86°C. At these temperatures, the choice of materials is greatly narrowed because of the tendency of traditional polymer-based materials to become brittle and fragile while frozen. “Breaking and cracking is a major concern when handling a bulk drug which may be valued in the hundreds of thousands of dollars,” said Cintavey. PTFE’s use in the STA-PURE™ flexible freeze container makes sense because one of PTFE’s most interesting qualities is its durability when frozen. PTFE is also well known for its high purity, inertness, and biocompatibility. “Because of the molecular stability of fluoropolymers, like PTFE, used in the construction of these containers, contamination of the product due to leachables and extractables is not a concern as is the case with traditional polymer-based container materials,” added Cintavey. Although Gore’s PTFE material is endowed with a number of positives as a construction material for low temperature storage containers, it cannot be gamma sterilized, the method of choice in pharmaceutical processing. “We have found that irradiation is not an option, as it causes unacceptable degradation to the molecular structure of the material,” he stated. Instead, the bags are sterilized with ethylene oxide, an approach commonly used in implantable medical devices. The decision to pursue single-use technologies in biologics manufacturing as opposed to multiple use is by its nature complex, but even more so in large pharmas with footprints that cover the planet, as exemplified by Bristol-Myers Squibb (BMS). With operations in many countries, its bioprocessing protocols are under constant updating and revision, as companies scramble to keep ahead of one another. “As we move our molecules into clinical production, we are converting previous hybrid operations to entirely single use,” said Lance Marquardt, associate director for upstream processing at the BMS Hopewell, NJ, facility. With a large number of different molecules, the Hopewell site is geared to handle 10 different projects with up to 4 underway at any one time. There are two separate suites, and the upstream and downstream facilities may simultaneously process different molecules. These turn around activities can be completed in as little as one day in the upstream phase. The Hopewell facility and the company’s clinical manufacturing facilities in Devens, MA, are now 100% single use with the exception of the downstream purification columns. Another site, in Cruiserath, Ireland, has integrated single use for production up to the 2000-L scale in the seed train and up to 1000-L for media and buffer preparations, with about 30% of all operations done in single-use or disposable systems. The company’s large-scale plants in Devens, MA, and Syracuse, NY, utilize mainly stainless steel, but employ single use and disposables throughout the cell expansion phase to the 25-L scale and up to 200 L for media and buffer preparation. Less than 20% of all operations at these plants are single use. Facilities typically have their own site-level management structure. There is a supply planning group that coordinates overall commercial and clinical supplies with internal and external manufacturing capabilities and determines which plant site will be asked to manufacture which product and how much to be produced in a given campaign. MilliporeSigma is currently carrying out a major program for improving site design, according to William Faria, head of operations, and Sara Bell, senior marketing manager, both of whom work out of the company’s Danvers, MA, facility. The aim is to advance efficiency and speed the delivery of product. As a company with an international presence, MilliporeSigma operates facilities all over the world. But while water, utilities, construction costs, and salaries may vary widely, these are not the deciding factors in plant location and design. Strategic fit, customer reach, and availability of talent are the most important part of this decision. But the primary need “is the overall footprint and how it fits into our long-range strategic plan,” states Faria. Can SUBs and SUMs Be Best Friends with QC Micro and EHS? “Single-use technology can reduce new manufacturing facility startup timelines since clean-in-place and sterilize-in-place (CIP-SIP) cycles do not have to be developed and become certified,” stated Katherine Leitch, director of technical services at Alexion; she discussed microbiology quality control (QC Micro) guidelines and environmental, health, and safety (EHS) guidelines and their impact on the adoption of single-use bioreactors (SUBs) and single-use mixers (SUMs). The safety advantages of single-use technology include the reduction of high hazard safety risks to operators. When using single-use technology there is less potential exposure of operators to hazardous energy since there are no CIP cycles, no SIP cycles, and no high processing pressures. Leitch asserts that an important advantage of SUBs is that any sterile boundary integrity issues are highly visible so there aren’t unknown concerns, as is the case with stainless-steel systems which may be endowed with complex automated valve sequences. Although the potential for bag leaks is a disadvantage, this exigency can be dealt with through adoption of a pre-use pressure test after bag installation. She adds that SUMs have an advantage over SUBs in that generally bag leaks from a SUM have less potential impact to product quality and batch success than leaks from SUBs. Leitch also mentions bioburden control and the risk of microbial contamination in single-use technology. The economic impact of batch failure due to a bioburden incident is enormous and could cost a firm billions of dollars in lost revenues and correction of the root causes. A significant advantage of single-use bioreactors is that integrity issues of the sterile boundary are highly visible. From a bioburden control perspective, since there are no reusable product contact surfaces in single-use systems, there are no risks of biofilm development which reduces potential multi-lot product quality risks. In choosing between single-use and multi-use solutions, there are a number of factors that need to be reckoned with, as companies seek to develop a set of general principles to govern the selection process. Today, the overriding consideration is the scale of the operation, with decision makers favoring using single-use technology in batches under 1000 L and multi-use solutions for larger quantities. Other factors affecting the decision include the type of product (batch versus continuous), the phase (clinical or research) of the product, reductions in cleaning requirements, capital investment, turnaround time, and risk of product cross-contamination. The weight of these considerations is sure to change in the future, as the technology is changing rapidly, which is sure to influence the decision. Optimization of lentiviral vector production requires a detailed analysis of upstream processing, notes Carol Knevelman, Ph.D., head of process R&D at Oxford BioMedica. She presented her team’s work on the design and application of this technology for use in gene therapy protocols at the Sartorius Stedim Biotech Upstream & Downstream Technology Forum in Goettingen, Germany, earlier this year. Oxford BioMedica’s LentiVector® platform is an advanced lentiviral-based gene delivery system designed to overcome the safety and delivery challenges associated with earlier-generation vectors. The platform was designed so the vector can be modified for a wide range of applications, including selective targeting for gene and cell therapies. The vector has been adapted for CAR-T cancer therapy and has been successfully employed in a long-term Parkinson’s disease project, recently licensed out to Axovant Sciences. Clinical trials utilizing the first candidate product, ProSavin®, have previously demonstrated encouraging clinical benefits in Parkinson’s patients.